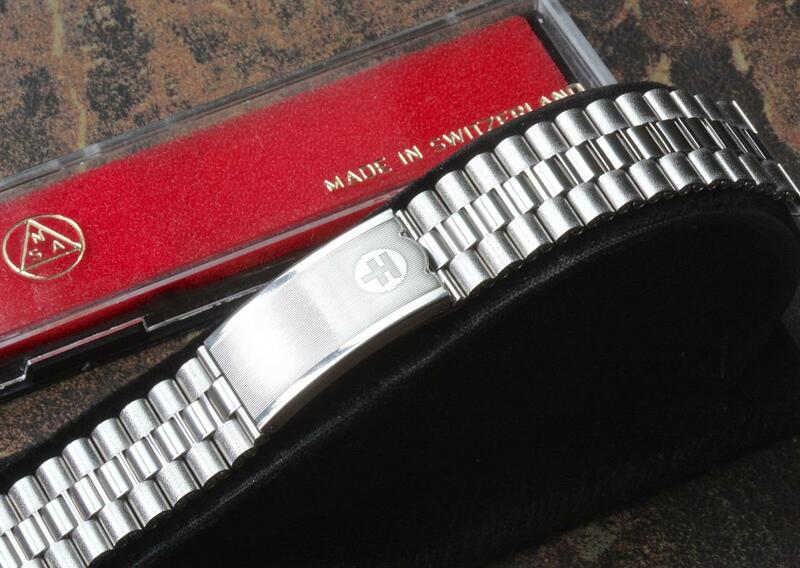 Here is a rare vintage Felca watch Swiss Made vintage stainless steel watch bracelet that is New Old Stock from the 1960s/70s. Perfect complement to a Felca tool watch like the Felca Seascoper a Felca Super Compressor or Felca chronograph. This 3-row link style NSA model came on several popular vintage dive watches as well as alarm watch vintage models from the 1960s and 1970s. 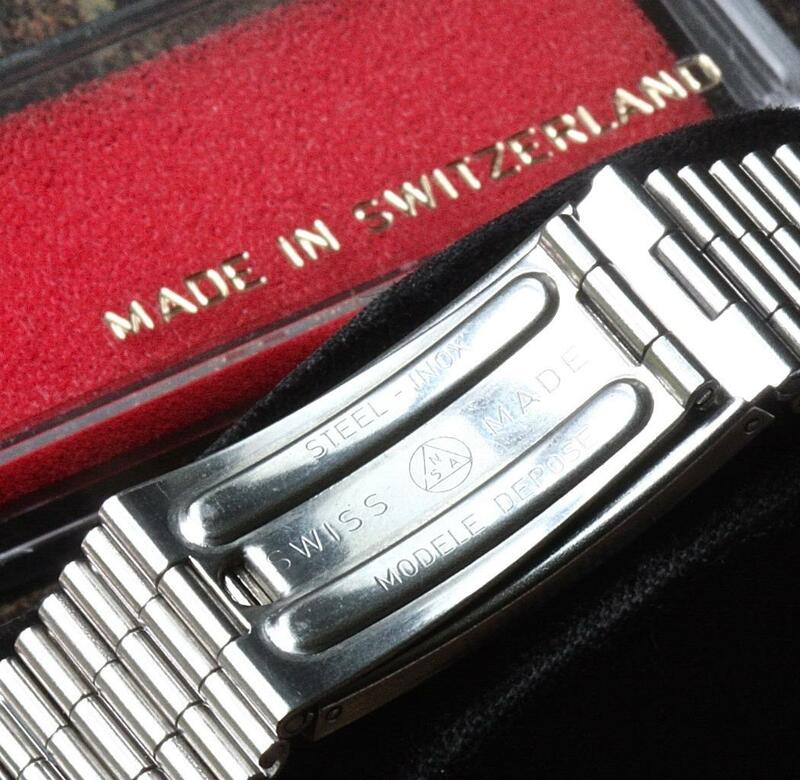 This Felca band was made by NSA Switzerland, also known as Novavit, maker of some of the finest vintage watch bracelets at the time. Polished center finish/brushed outer finish on the 3-row links. The pattern is carried over nicely on the ends. 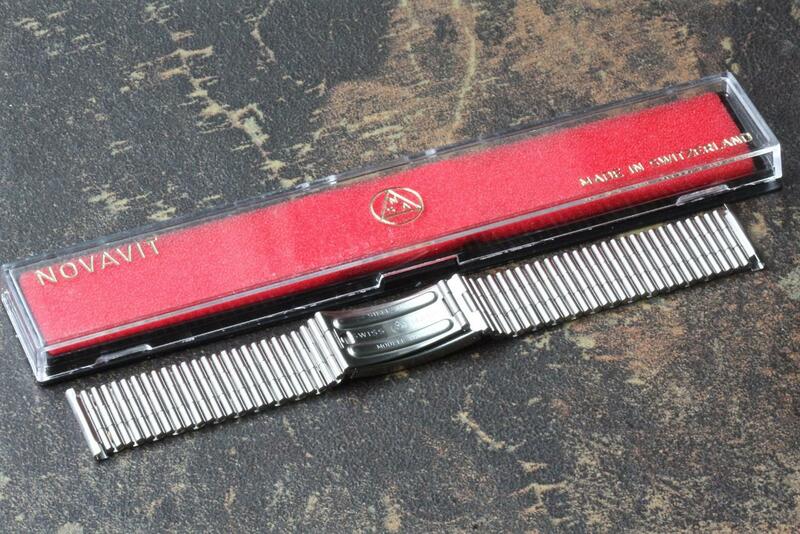 This band can come with 18mm 19mm or 20mm straight ends, or 18mm curved ends. Bracelet is 6 1/4 inches long (15.8cm). Every link is flexible and removable with a nail type pin that slides out, perfect for micro-adjustment. 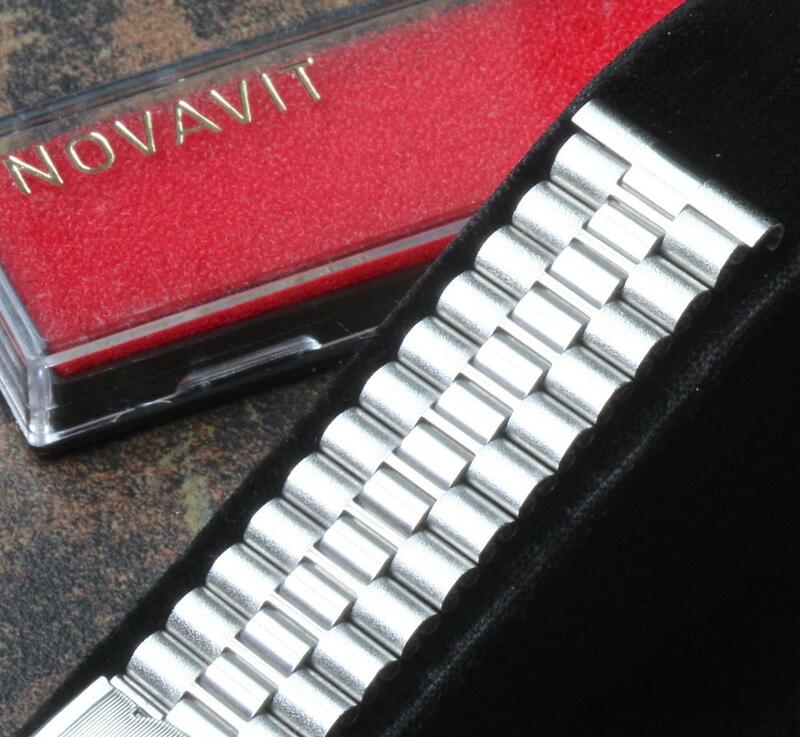 Extra links are available at a nominal cost if you need a custom long-length bracelet. 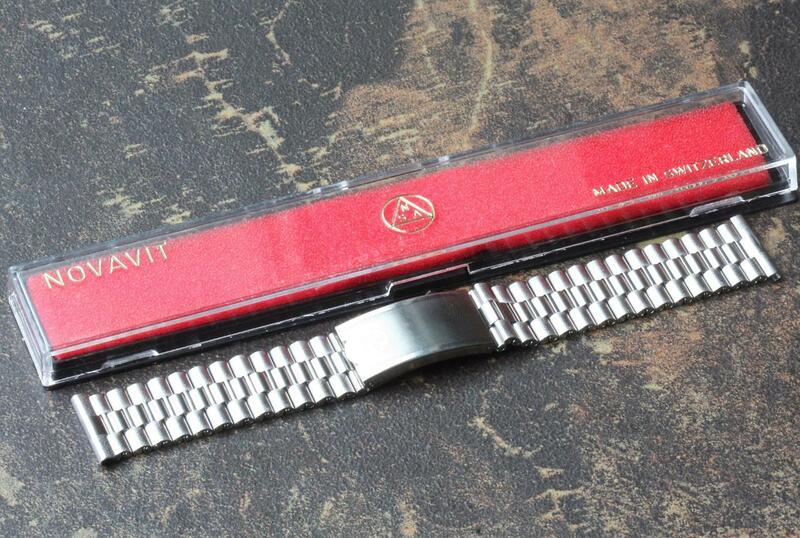 The bracelet has the NSA trademark spring-loaded comfort clasp (shown extended in one picture). This special deployant clasp design "gives" by 5/8 inch as you wear it for perfect comfort (your wrist size changes with temperature changes, and this feature compensates for that rather than the band feeling tight or loose during the day). This is a feature that is not found on many much more expensive bands. Signed NSA Swiss Made Modele Depose. Comes in the original NSA Switzerland box shown. SHIPPING: U.S. shipping with tracking is $6.99. International buyers pay $34.99 for Registered international shipping or $59.99 for faster EMS delivery. 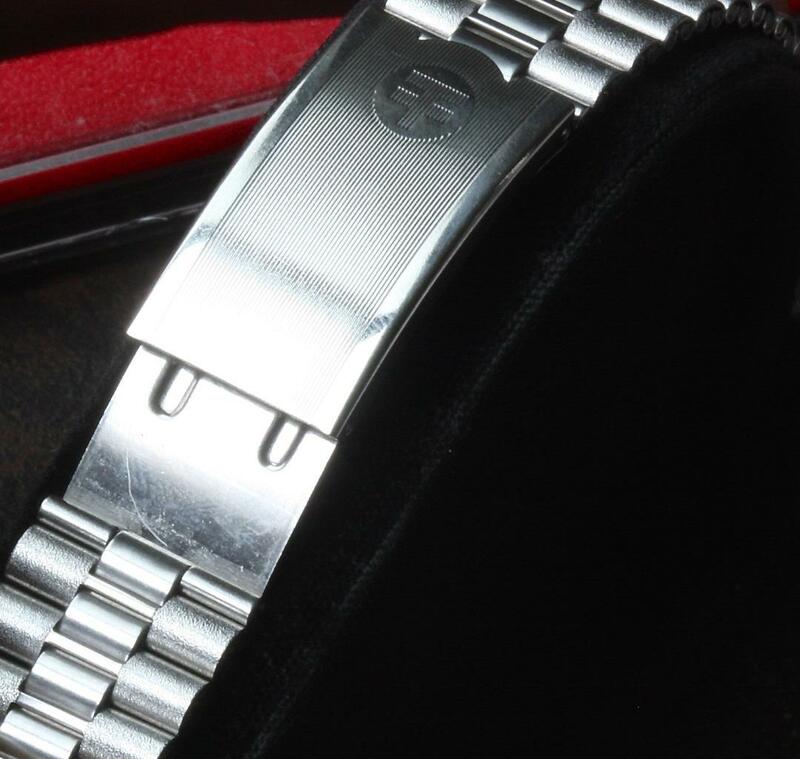 One of nearly 200 NSA Swiss watch bracelets and NSA parts you will find at squinky.com included branded NSA bands for Zenith Zodiac Movado Rado Certina Cyma and Titus dive watches and chronographs.